Size: 12.4" x 8.5" x 3.1"
The TI-5155 - and its twin TI-8250 - includes every feature you expect from a high-end office printer. It combines a two-colur impact printer with a heavy duty construction. The calculator is performing calculations with 10-digit precision. The TI-5162 combines a sleeker design with 12-digit precision, while the TI-5317 uses an almost identical housing. The featured calculator was manufactured in Taiwan for the European market and is powered with 220 volts. The Date code suggests that Compal Electronics assembled the TI-5155 in its Taiwan facility. 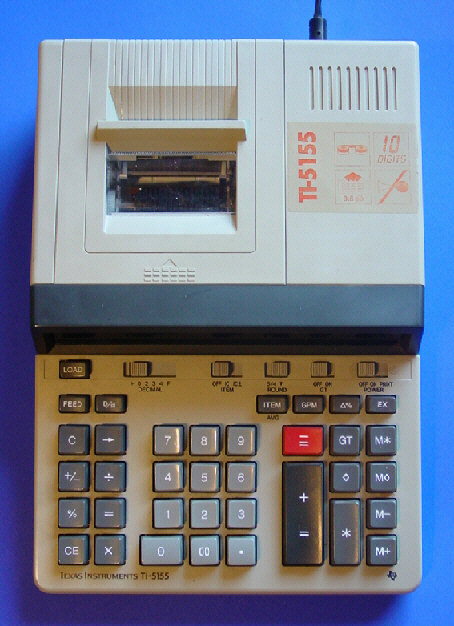 Texas Instruments defined later with the TI-5630 a new standard for 12-digit office calculators. © Joerg Woerner, July 5, 2002. No reprints without written permission.